Many of the photos I have used to illustrate how London has changed are of the more well known views of London, from the Stone Gallery of St. Paul’s Cathedral, from Greenwich, from Waterloo Bridge, the Royal Festival Hall etc. however sometimes to get a real understanding of how London has changed since the last war in terms of the streets, buildings, employment and people, you need only look in some of the more ordinary, mundane places. I was unsure of where my father took the subject of this week’s post. There are two photos, taken from within the same tunnel, looking out to streets with closely packed warehouses on either side. The warehouses with their trademark walkways over the streets were clearly along the Thames. The tunnel in which the photo was taken would be adjacent to one of the stations or bridges across the Thames. I vaguely recognised the tunnel from many walks along the south bank of the river, and a morning exploring all the tunnels finally found the location, however the changes were such that I was still slightly unsure (I will explain how I confirmed the location later). The first photo, and it is a Sunday, early in 1947 and a solitary man walks with his two dogs towards my father taking the photo from the middle of the tunnel. These two photos really show how London has changed in the intervening 68 years. In 1947, shipping was still coming this far up river to be loaded and unloaded at the warehouses that ran the length of the river. The warehouses on the right were facing onto the river, walkways over the street lead to further warehouses. 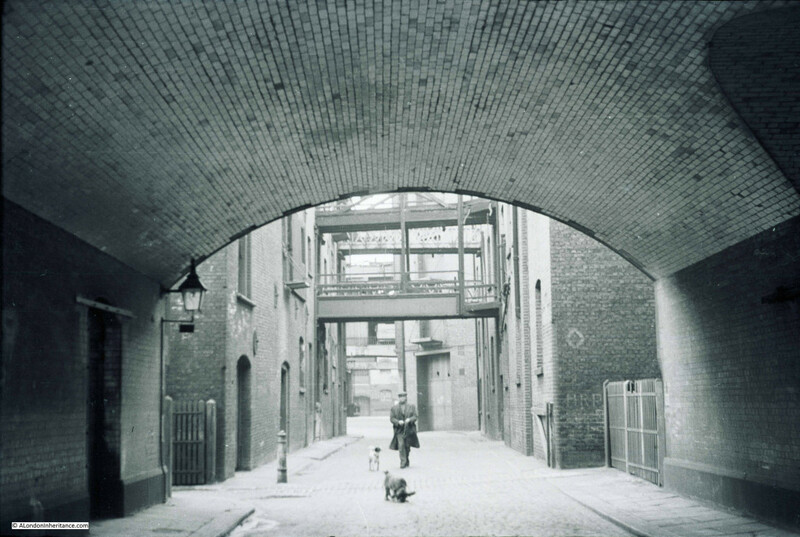 Pickle Herring Street in the 1947 photo is the street winding through the warehouses, it had been here for many years but has now disappeared along with all the warehouses lining this stretch of the Thames in the redevelopment of this area of the south bank for City Hall (the building that appears to lean backwards in the 2015 photo), the home of the Mayor of London and the Greater London Authority, along with the public open space created up to Tower Bridge. Instead of the solitary Londoner walking his dogs we now find the thousands of tourists who follow the walkway along the river and cross to and from the north bank and the Tower of London via Tower Bridge. It took a while to take the 2015 photos, I was waiting until there were not too many people in the tunnel, such is the popularity of this area even on a chilly March morning. Not long after I took the photo, an ice cream van arrived and parked to the left of the tunnel entrance. I wonder what the man in the 1947 photo would have thought about how London would be changing over the coming decades. 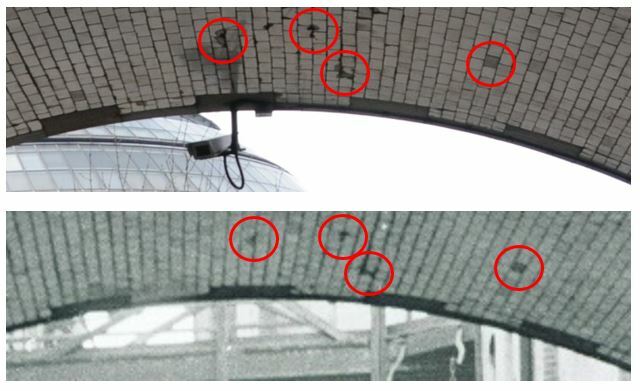 The change was such that I was still slightly unsure that this is the correct location of the 1947 photo, so I checked the tiling on the roof of the tunnel. The following photos show that even across 68 years the same defects and damage to the tiling can be found. 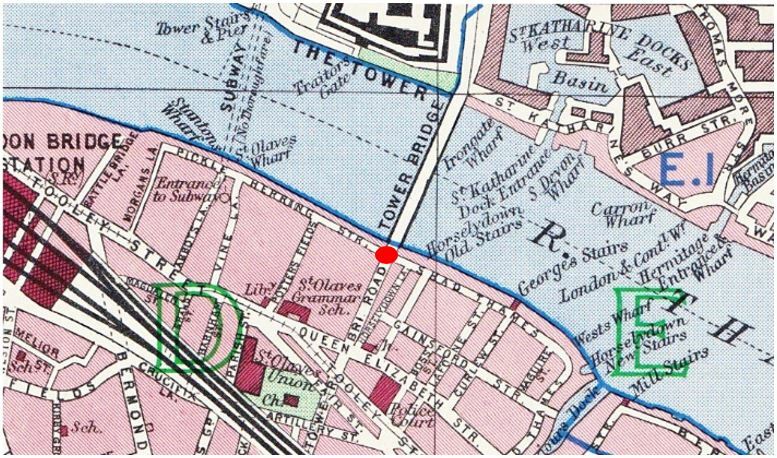 In the following map from the 1940 edition of Bartholomew’s Reference Atlas of Greater London I have marked the location from where the photograph was taken with a red dot. 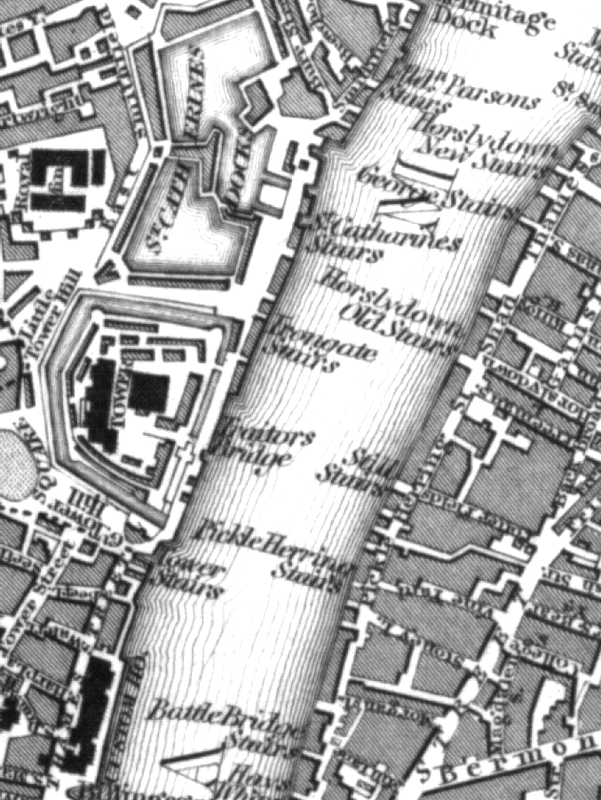 The following early 19th century map extract shows the area prior to the construction of Tower Bridge. There was also a Pickle Herring Stairs roughly where St. Olaves Wharf is shown in the 1940 map. Note also Horslydown Old Stairs. This is where Tower Bridge would be built later in the 19th century. Despite having such an interesting name, I have not found that many references to Pickle Herring Street. The name must refer to the landing and storage of pickle herrings here at some point in the past. The buildings would be exactly the same in 1947. 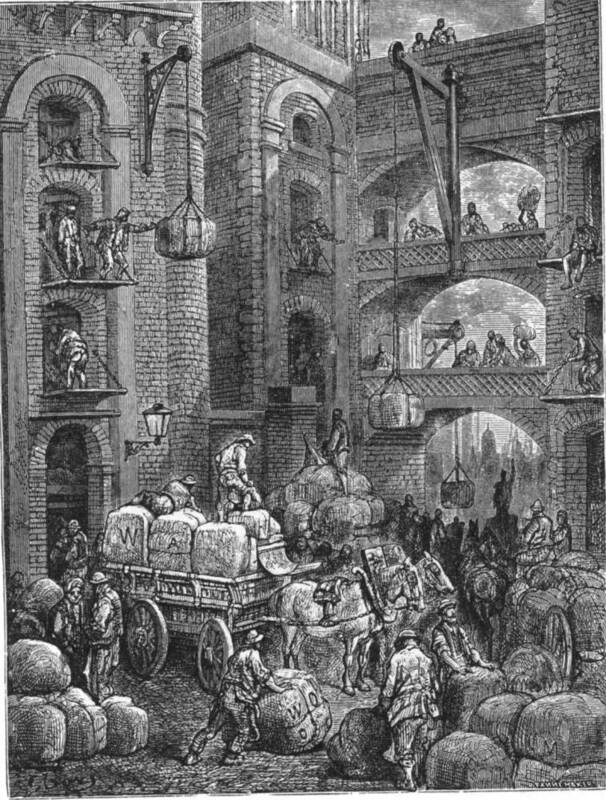 Doré probably used some artistic license in this drawing, the buildings look rather too finely built for riverside warehouses, however it probably does give a good impression of the atmosphere in Pickle Herring Street at the time. Return to the dot in the above map, turn to the right and you will be looking down Shad Thames. This was the scene in 1947 looking down to the next stretch of warehousing running the length of the river. This was Butlers Wharf. 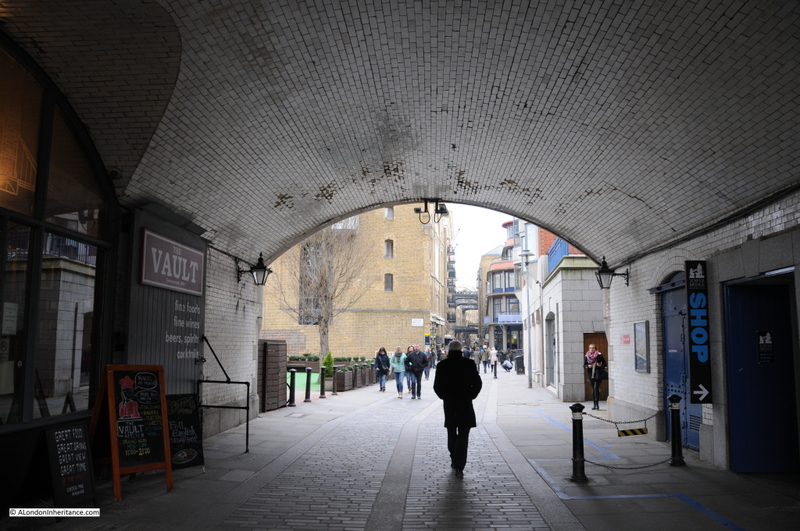 In 2015 Shad Thames remains as does Butlers Wharf, although converted into luxury flats, restaurants and shops, again indicative of the changes across much of central London. 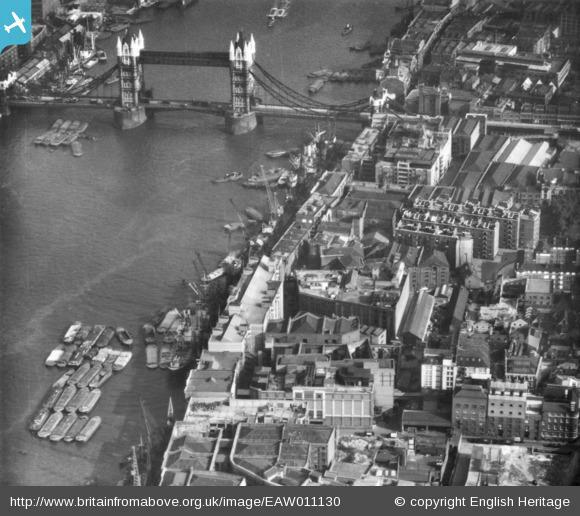 The excellent Britain from Above website has the following photo of the area, also take in 1947. The warehouses on either side of the approach road to Tower Bridge can clearly be seen along with the cluster of shipping and barges up against the warehouses along Pickle Herring Street. I stood for a while in the tunnel waiting to take the photos, in exactly the same place as my 18 year old father back in 1947, under the same tiled roof, but looking out on a very different world. This entry was posted in London Streets, The Thames and tagged Bermondsey, Pickle Herring Street, River Thames, Tower Bridge on March 22, 2015 by admin. What a lovely post. Great stuff. Great post and detective work David and lovely to see your Dad’s photos when Pickle Herring made some sense. I think Horselydown stairs are still in the same place to the east of tower bridge and your approach road arch. Do you know too Tom Bolton’s book, vanished city – London’s lost neighbourhoods – he has a section on this area with photos by SF Said of a few other remnants/evocations. I will take a look for Horselydown Stairs when I am there next, I had assumed they were a victim of the construction work for Tower Bridge, but will be great if they have survived. I also have some photos my dad took of the riverside at Tower bridge so they may show some detail. Yes, have seen Tom Bolton’s book, but have not yet bought (always trying to catch up on reading). I will make it a priority. Great article and photos! I worked for Theatre Despatch in 1979 when it was based in a warehouse on Butlers Wharf. The buildings were still as they looked in 1947. Our ‘office’ was barely converted and had improvised electrics and no plumbing – I had to fill the kettle from a standpipe in the yard. To go to the loo I had to go to the Wash House which was right on the river. I assume people who lived in houses nearby still used it for washing clothes and themselves. It was a bit grim especially in winter but it was also amazing – I crossed Tower Bridge and stepped into a Dickensian world every morning. Bee, thanks for the comment. It was not until the 1980s that the redevelopment of the area started. I can imagine it must have been grim at times, but an experience to work in these warehouses before the area changed. As you say, stepping into a Dickensian world. It is a very different place today. Great detective work! I am a little surprised how little bomb damage is visible in the aerial view from 1947. Have I missed it, had it been repaired already, or did this area not suffer much? Indeed, “Shad Thames” may be a corruption of “St John-at-Thames” (although the new parish was only created in 1733, and “Shad Thames” was used on the Rocque map of 1747, so it is not clear to me that a new corruption could become common coinage in just 14 years). Past Butler’s Wharf you soon get to St Saviour’s Dock and then Jacob’s Island, a rookery immortalised in Oliver Twist. It is not so down at heel now! In the other direction, your 1940 map shows the Tower Subway, which still exists under the river but is closed to the public. 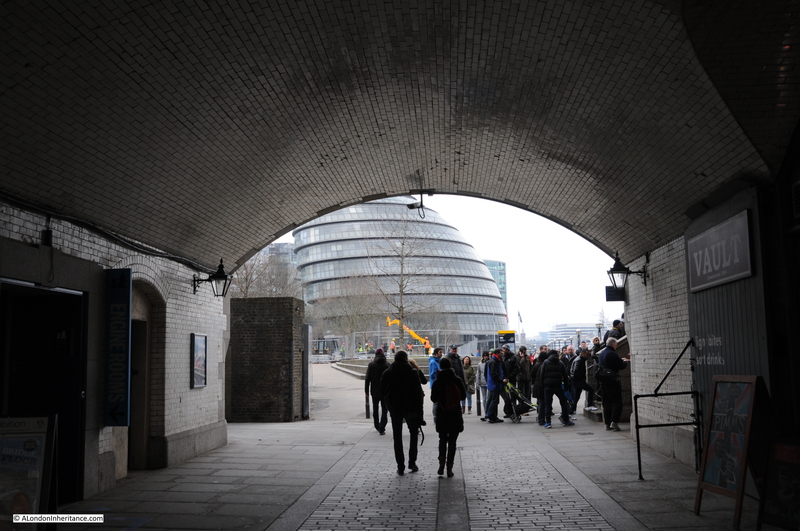 The area is generally known as Potters Fields now – you can see a street of that name on your 1940s map. Andrew, thanks for the information, very interesting. I checked the LCC Bomb Damage Maps and the majority of damage in the area was classed as “General blast damage – not structural” so I assume this may have been reasonably easy to repair, rather than rebuild. I agree with your thoughts on Shad Thames, it would be unusually fast for common usage of the name Shad Thames. I understand that the Tower Subway has been used by the Utilities for many years and the photos I have seen of the tunnel show a large number of pipes. It would be very interesting to take a look! The place name Shad Thames appears on several tradesman’s tokens issued from business in the same location during the mid-17th century. I found this all so fascinating and such an interest as it is one of my much loved summer walks after crossing the Bridge from the Tower. I have been researching my hubby’s family who’s line first began in the Village of Capel, which is near Dorking. I have Births, Baptisms, Deaths and census of 1841 showing the first of the Chandler’s from Capel, William Chandler born 1800 ‘Hoopbender’ living in Queen Elizabeth Street. Here the family appeared to survive the out brakes of Typhoid, living to a good age or marrying on to begin their own families but all still living within Horsleydown until around 1871 where they moved down to Rotherhithe. Another branch of the family are the ‘Honeyman’s – watermen’ and ‘Still’s, also watermen/watchmen’. One family of the Still’s are Robert W Still, born 1859, his wife Sarah Ann Still nee Honeyman born 1860 and their three sons Joseph J born 1883, Robert W born 1887 and Frank born 1889. In the 1891 census they are living in Hanover Buildings, Pickle Herring Street, Horsleydown – Southwark. I have looked at your maps but I can’t seem to find anything looking like living accommodation. I have also researched on line finding in the Booth site a mention but not stating where abouts it was situated. Maybe you can help me by way of finding out? I’m having to do quite a bit of detective work regarding this branch. It appears Sarah married again, so I presume Robert died but at the moment I can find no record. As for Sarah she later married a Thomas Stretch he passes before the next census but I have found Sarah and one son on the 1891 census as a ‘visitor’ – Robert is with her but instead of being Still he has been ditto under her surname of Stretch. As for the other twosons, no records have been found as yet for Joseph but I believe Frank went to Australia. Hi, that is a fascinating family history. When I was researching for this post, I could not find very much information about Pickle Herring Street or the buildings along the street. I have a whole range of books going back a couple of hundred years and there was virtually no reference. I assume this was a basic working class area with, at the time, not much thought worth recording. I have found the London Metropolitan Archives a very good source of information. I did a quick search at the National Archives online service, but the only reference to both Hanover and Pickle Herring was to a Hanover Stairs in Rotherhithe. I will let you know if I come across any information. Not on Pickle Herring Street itself, but perhaps near enough? I have found one line of my family tree living in Hanover Buildings which is listed as being on Tooley Street. They were built about 1875 by James Hartnell as model dwelling tenement blocks, an early example of social housing. They were renamed Devon Mansion during the first world war, and were refurbished during the 20th century to include bathrooms. There is information about them on http://www.exploringsouthwark.co.uk/devon-mansions-tooley-street. Thank you Jennifer – your message and link very interesting. Helps explain what happened to make Fair Street all but disappear. In the film “Pool Of London” the ship is docked in what looks like this area and there is a lot of filming around there. Andrew, thanks so much for this site. 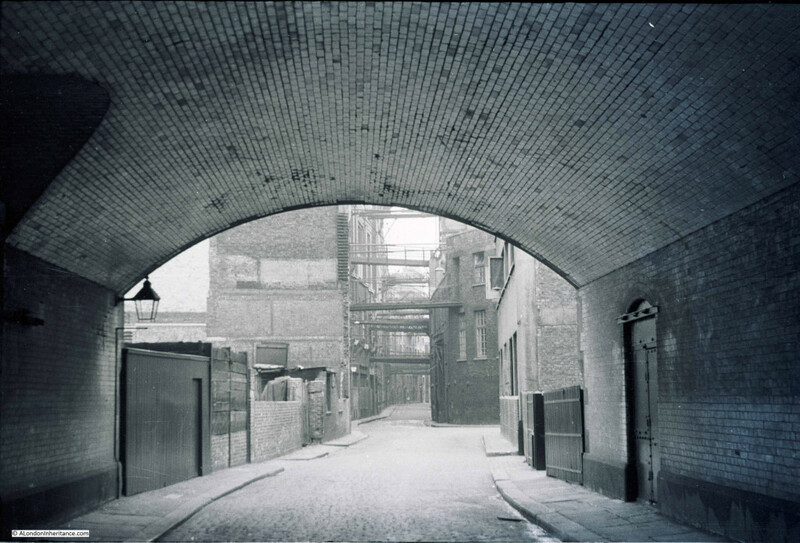 Very exciting for me as my 2xgt grandfather, Edward Samuel Hicks (1816-1891) was the wharfinger who owned the freehold of Pickle Herring Lower wharf in Pickle Herring Street off Tooley Street. From my research of insurance records I believe they were of wooden construction before the great fire of 1861 which obviously helped the combustion! I have recorded these plans which show the locations of all the different businesses, pubs etc that existed which is snapshot of just how busy it would have been. The originals are/were in the Borough Records Office when I saw them who may well have more information. Very interesting. I worked on the new Tower Bridge machinery in the 1970s. By that time the warehouses west of the Tower Bridge approach had gone and the whole area was a huge lorry park with a dirt surface. Our site office was on the left, just past the gates to the Tower Bridge workshops and steam pumping engines which were (and still are) immediately adjacent to the arch. The name “Pickleherring Street” was still valid even though it was only about 10 yards long, but we were the only remaining address in it. This caused all sorts of confusion because the lorries delivering materials to the site usually couldn’t find us! I am currently researching a 17th century token issued by a trader operating from a business at Pickled Herring Stairs. In his Will, dated, 1676, he confirmed that at that time one of his business ventures was in the Pickled Herring trade. As such this association with this area of Southwark must go back to at least the third quarter of the 17th century. In reply to Antiquarian – I have a coin which I recently purchased which reads “EDWARD BRENT HIS HALF PENNY 1663”. He was of St Olave’s Southwark, was made an assistant of the shipwrights’ company and later became an alderman of London though I am unsure what his business actually was that required his own money being minted. Hello Lynda – That is the same token that I’m currently researching. Having started to transcribe a copy of Edward’Brent’s Will of 1676 I’m no longer convinced that he had anything to do with the Pickled Herring trade or that it was still in existence at that time in this area of Southwark. My earlier report above was based on a recent published summary of Edward’s Will. I now believe that this summary contained an error in one part resulting from a miss-transcription. Any information you have on Edward Brent would be greatfully received. I hope to write up this token and Edward Brent’s story (one part of it I have) on a future entry on my web site at C17tokens@outlook.com. The home page introduction to this site will give you the reasons for the production of tradesman’s tokens in mid-17th century Britain. Fascinating historical account of Pickle Herring Street – there is a Edward Samuel HICKS 1816-1891 buried in Brockley & Ladywell cemeteries ( assume same person? ) & interestingly an etching of Pickle Herring Wharf c 1878 by the American artist James McNeill Whistler..
Vice-Chair : Friends of Brockley & Ladywell cemeteries. Yes, Edward Samuel Hicks 1816-1891 buried in Brockley & Ladywell cemeteries is one of the same man (my 2 x gt grandfather) who was the proprietor of Pickle Herring Wharf. He lived at Firhill, Southend Lane, Southend Village, betwixt Lewisham and Sydenham which was then the countryside with his wife Lisa and 7 children plus staff. The house was set in grounds with a lake and stables. It was acquired by the Leathersellers Company in the 1920’s and after WW2 was demolished to make way for post war council housing. All that remains today is the name ‘Firhill Road’. I recently acquired a Bill of Sale for Pickle Herring Wharf actually signed by Edward Samuel Hicks which I treasure. I could send you a photo of the grave of Edward Samuel Hicks if you would like it. Could you please tell me what the Fobic website is? I’ve an awful feeling I should know and it will be agonising obvious once you’ve told me! In “Wallington’s World: A Puritan Artisan in Seventeenth-Century London” by Paul S. Seaver writes, “In the spring of 1639 a drunken carman’s servant, returning home late at night to a stable in Pickle Herring in Southwark, had set a candle down carelessly in the hay and straw and started a fire which burned seven horses and more than 50 houses besides.” Pg. 55. I am interested in tracking down the location of what was once the Porcelain Warehouse, which faced onto what I think is now the Queen’s Walk, on the south bank, hard by Tower Bridge. It looked out on the pier where the HMS Belfast was moored in the 1970s. I managed a Tea Room there in the late 1970s, where people came to buy the china, which was stacked all anyhow up to the ceiling. We served tea and much more besides, on the china. I can remember walking down Tooley St and then a byway – not a tunnel, at least I don’t think so – to get to it. All industrial area with yards full of scrap metal and what not. Several issues of The Times in 1978 had an advert for the Porcelain Warehouse. The address was given as Curlew Street. Curlew Street is a couple of hundred yards downstream of Tower Bridge.